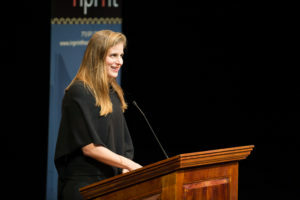 Last Monday night, the Inprint Margarett Root Brown Reading Series brought award-winning writers Lauren Groff and Ann Patchett to the Alley Theatre. Trying to find a seat in the sold-out crowd, I ran into a friend from my graduate program. We fell into a sudden and deep discussion about marriage, and what it means when only one rather than both members of a couple are able to pursue the career of their choice. How can you decide whose vocation will shape a family’s life? 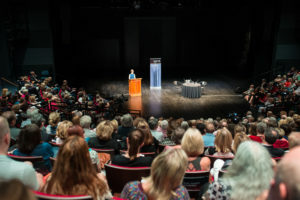 Both of the featured novels that night, Fates and Furies by Lauren Groff and Commonwealth by Ann Patchett, concern the consequences of marriage, either maintained or dissolved, and the discussion that followed revealed the depth with which both writers have entertained questions similar to our own. 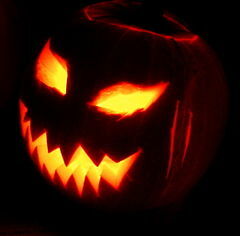 I asked several local literary tastemakers for their recommendations of spooky stories and haunting poems, inspired by this month’s Halloween celebration. After all, is there really a way to know that the person in the Ken Bone costume at your next party is not the man himself? The Gulf Coast Journal’s Reading Series presents writers from the University of Houston’s nationally acclaimed Creative Writing Program, as well as renowned writers whose work has appeared in the magazine. This Friday, the Series presents Lisa Olstein, Henk Rossouw, Corey Campbell, and Jennifer Staff Johnson at Rudyard’s Pub in Montrose. Reading starts at 7 pm. This week marks the very first public reading for Jennifer, who is a first-year MFA candidate in fiction at UH. 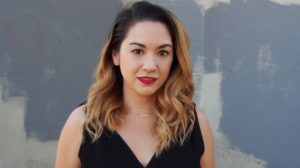 She sat down with Inprint blogger Charlotte Wyatt to discuss her work and how Houston has shaped her writing. 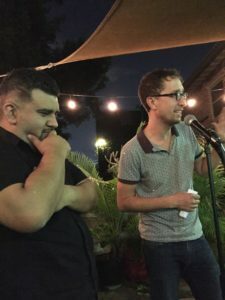 On one of the first cool nights of Houston’s autumn, September 27, Rodrigo Toscano flew in from New Orleans and Charles Alexander came from Victoria, Texas to deliver their singular and meditative poetry at Kaboom Books. They were brought together by a partnership between Failure to Identify and Tintero Readings. Failure to Identify bills itself as an “Occasional, Itinerant, Sporadic, Vagabond, Versatile, Irregular, Incidental, Intermittent, Roundabout, Accidental, Stray, Raro, Combustible series of arts & writing events.” Tintero Readings is the events arm of Tintero Projects, run by married couple Lupe and Jasminne Mendez, which “aims to promote writing and reading opportunities for emerging Latinx poets and writers in the Houston” and beyond. On Friday, October 7, Inprint is launching a new program, the Inprint Writing Cafe. From 9 am – 12 pm on the first Friday of every month, we will transform our workshop/meeting/readings space into a writing cafe, where all writers can come and spend the morning writing in the pleasant Menil neighborhood with the company of other writers. We are proud to present this essay, which came our way a few weeks ago and celebrates the power of people coming together as writers, by Ernie Williams. 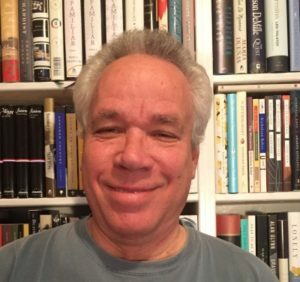 Ernie Williams, who works in the HVAC industry, has taken a number of Inprint workshops, in several genres, but he has found his deepest connection with the personal essay. A room in an old house. A well-worn wooden floor. In the center of the room stand two substantial wooden tables, surrounded by twelve chairs. The pale green walls are adorned with posters advertising literary events of long ago. The late afternoon sun peeks through the blinds, bathing this silent space in a harsh light. When this room sits empty, it is nothing, just four walls and a ceiling. But when people enter this space, it becomes something else entirely.